With room to sleep up to ten guests, River Retreat is a four bedroom, three-and-a-half bathroom cabin that’s perfectly suited for a fun getaway with friends or family. 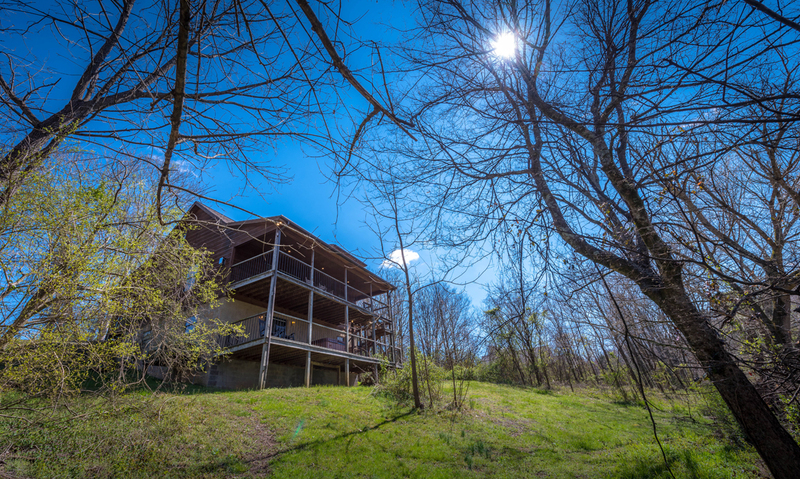 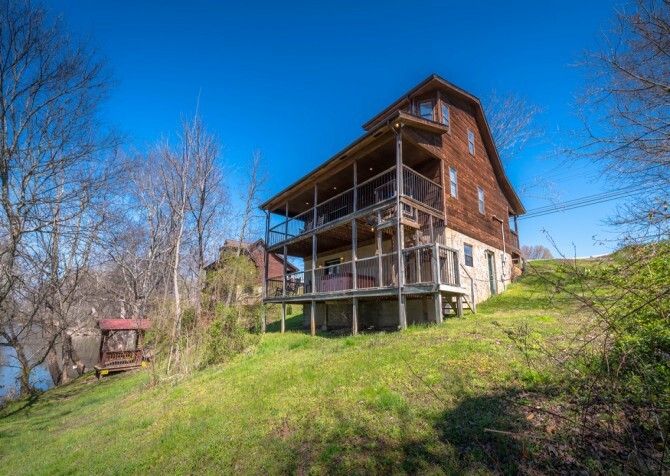 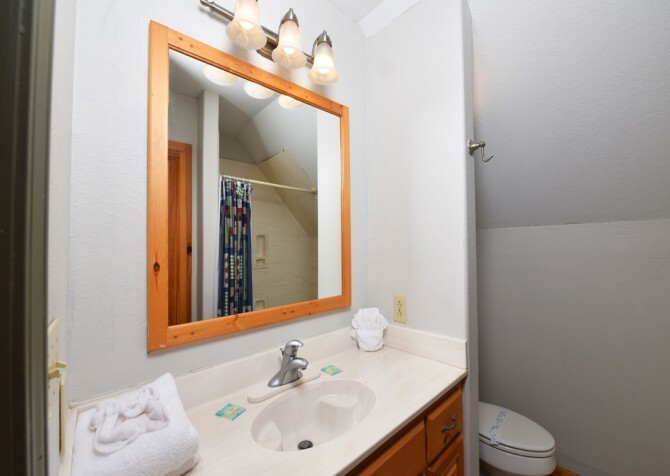 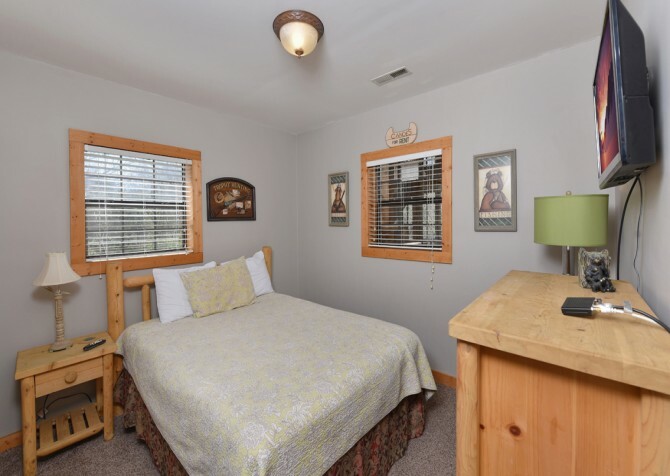 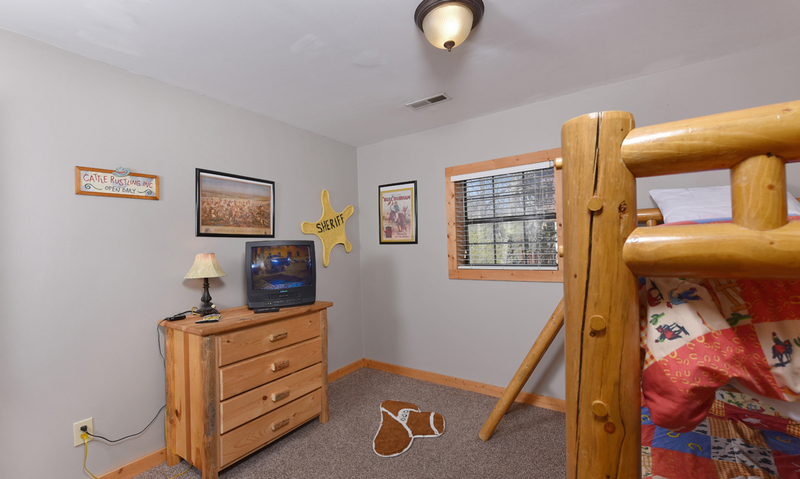 Complete with a fully equipped kitchen and a location near downtown Pigeon Forge, this lovely cabin rental offers comfort, convenience, and fun! 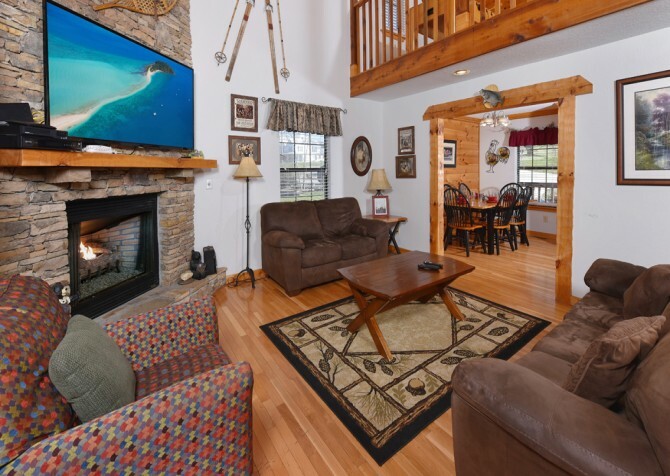 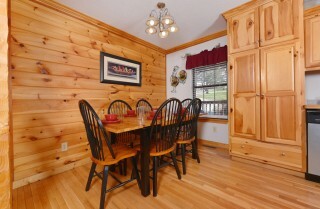 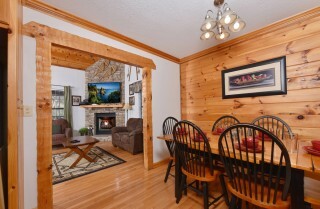 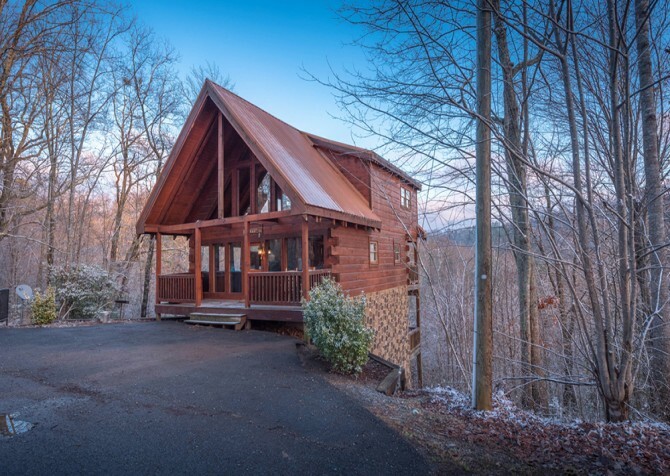 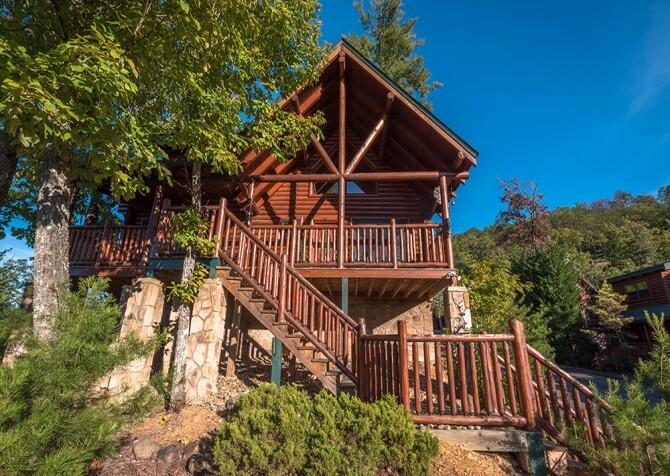 Decompress with a relaxing stay in this beautiful Pigeon Forge cabin. 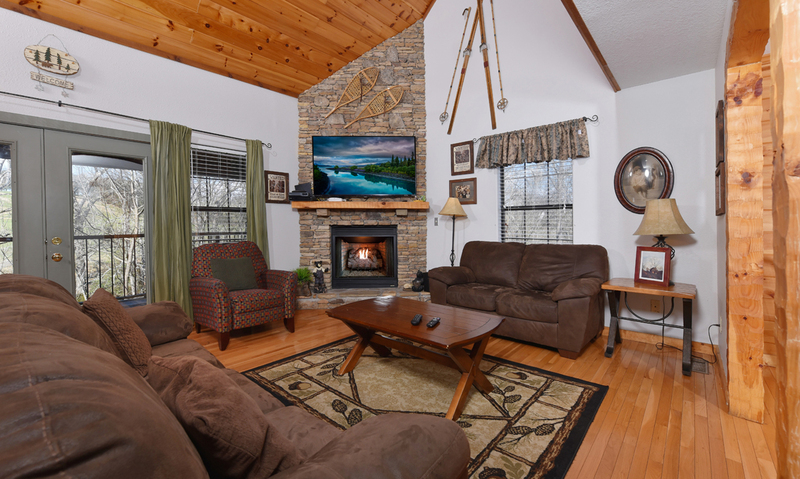 Less than eight miles from downtown Pigeon Forge, River Retreat keeps guests near all the fun of this bustling mountain town. 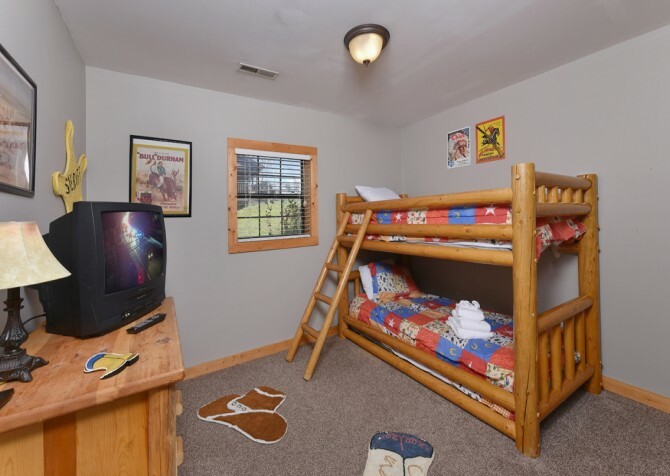 Kids will love being just a few minutes from Dollywood and Dollywood’s Splash Country, laser tag arenas, arcades, and go kart tracks, while adults will enjoy the convenience of area restaurants, dinner shows, and shops. There are plenty of things to do in town, but River Retreat also offers lots of fun. 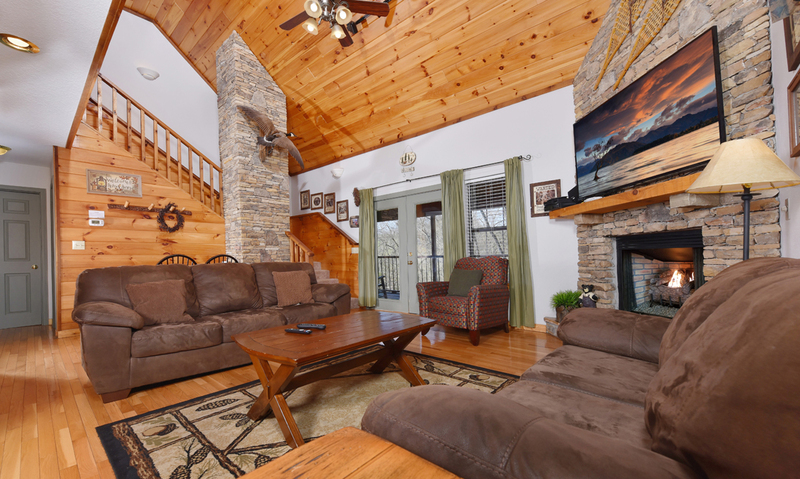 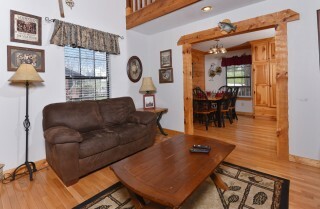 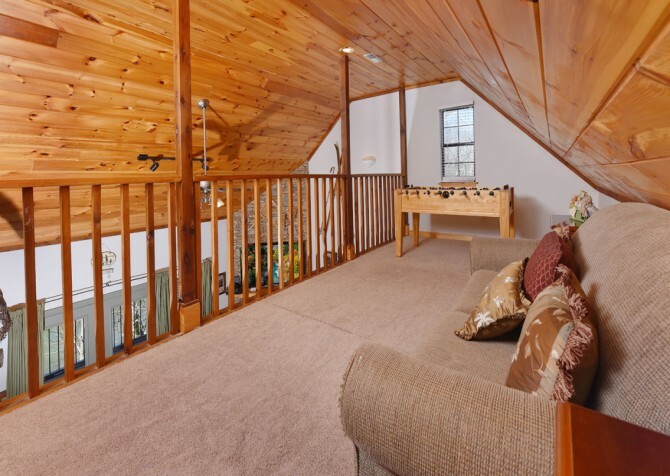 This Pigeon Forge cabin has a large living room with an abundance of seating. Keep warm by the fireplace as you watch TV and bask in the natural sunlight coming through the picture windows in the living area. 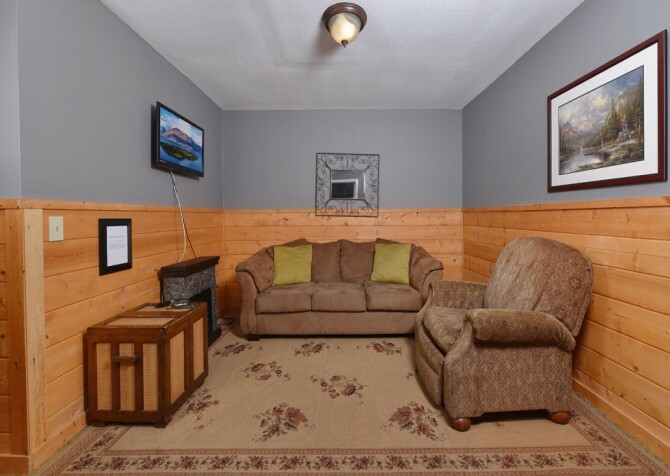 You can enjoy your favorite shows here as you catch up with friends and family. 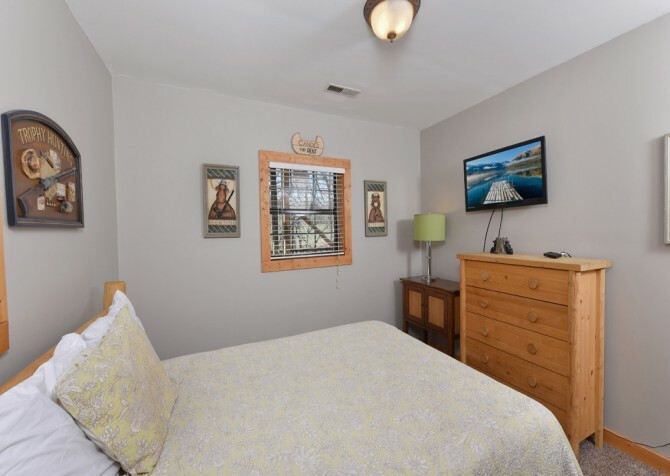 Several lamps around the room provide additional lighting for reading or hanging out at night, and another room with additional offers extra space for relaxing. With so many places to sit and relax, this cabin is just what you need for a well-deserved vacation in Pigeon Forge, TN! Offering plenty of comfortable sleeping space, River Retreat features one king size bed, two queen size beds, and one bunk bed. There is a queen sleeper in this cabin for additional sleeping! 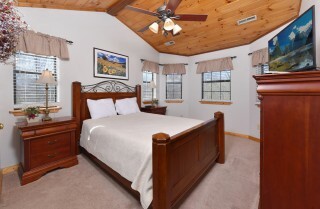 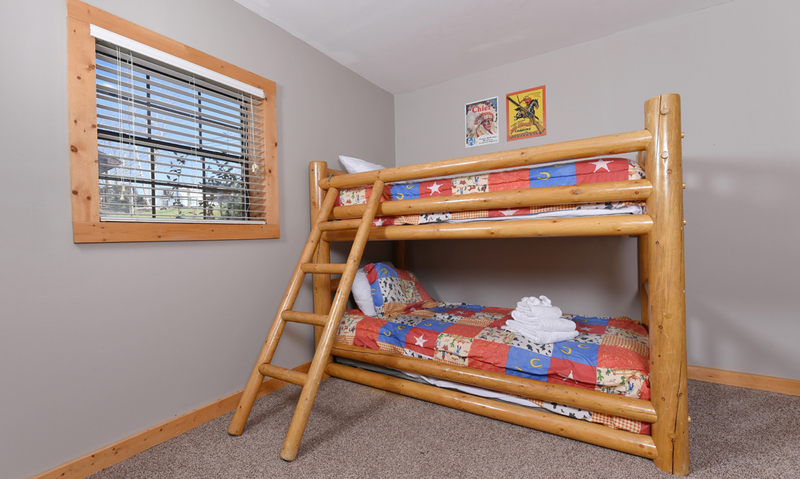 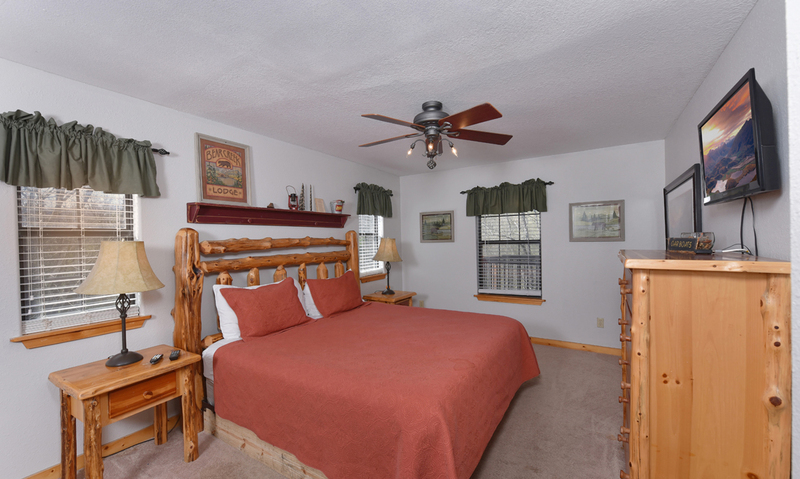 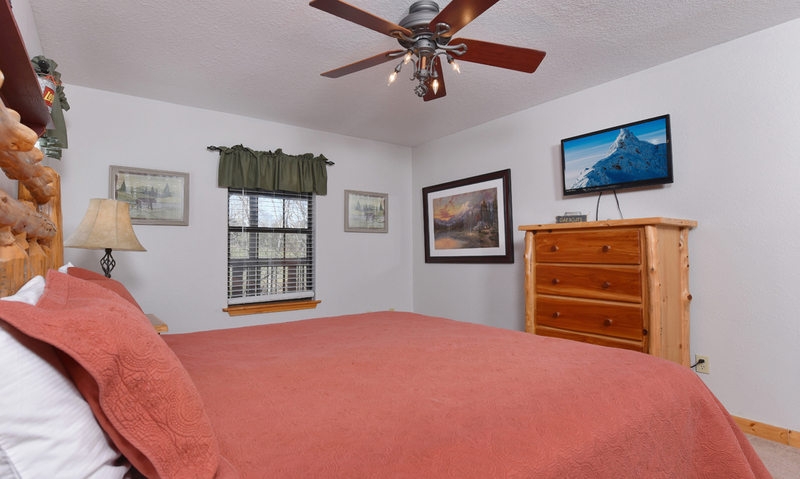 Each bedroom will provide a restful night, leaving guests ready for a fun new day in the Smokies. The two bedrooms with single beds have night stands with lamps on either sides of the bed, allowing guests to read before bed or to enjoy a quiet evening of relaxing. 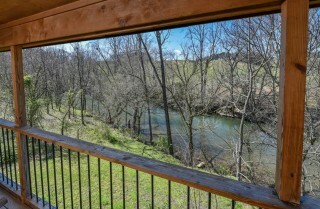 Both bedrooms also have windows that let in light while also offering a river view. Beautiful wooded and river views create a peaceful atmosphere here. 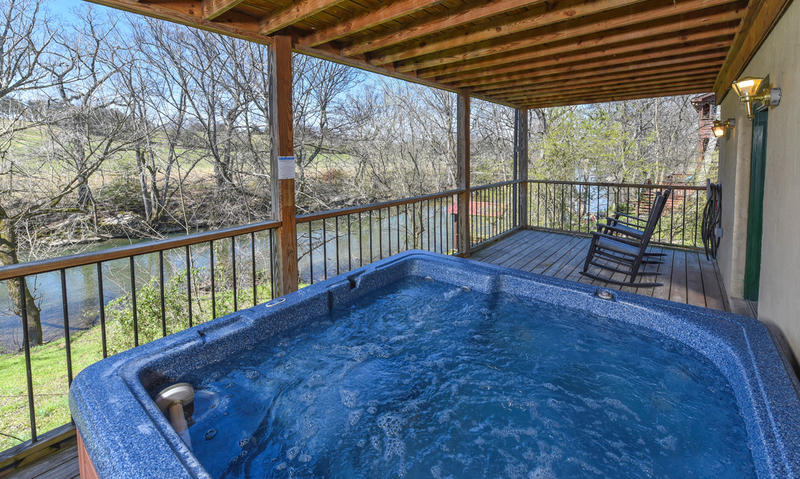 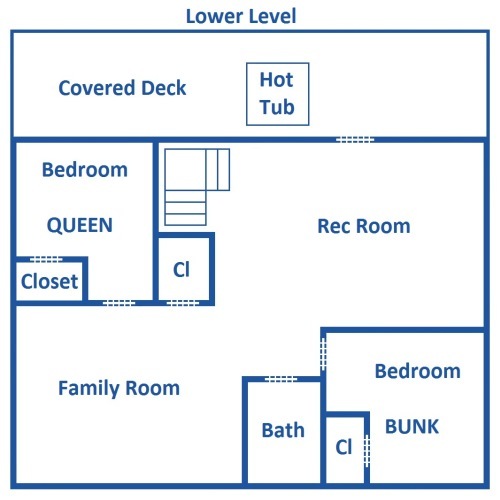 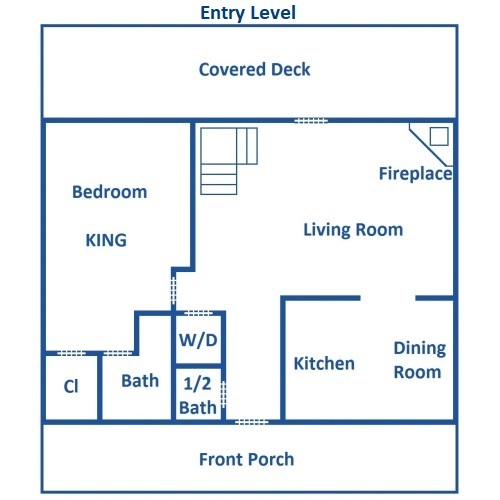 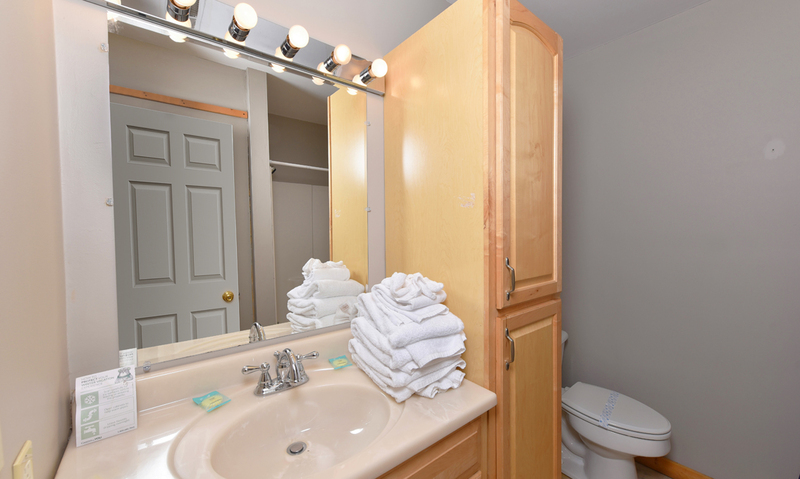 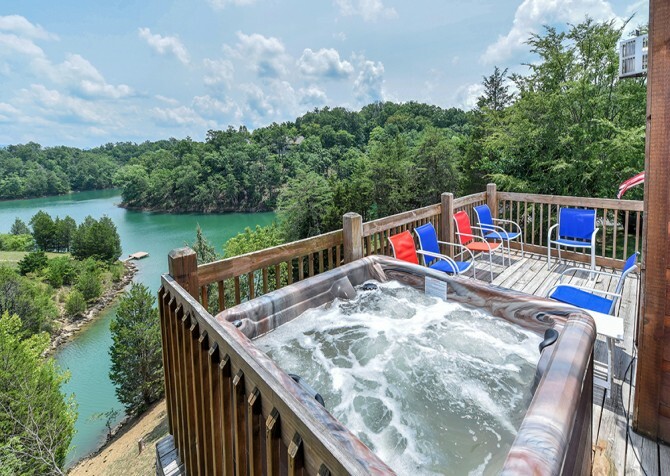 At River Retreat, you will find a large hot tub outside on the deck overlooking the river. 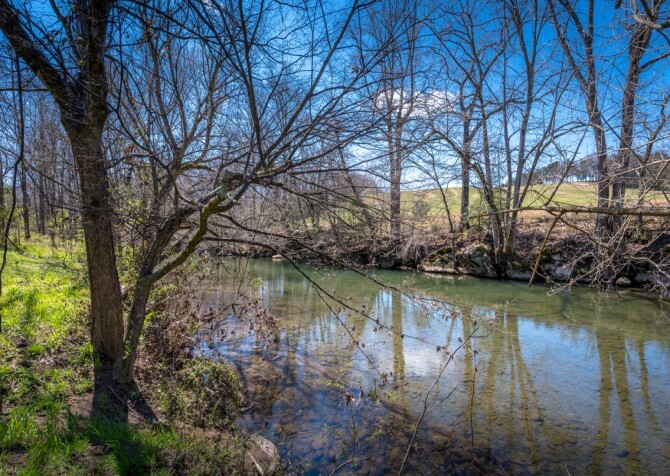 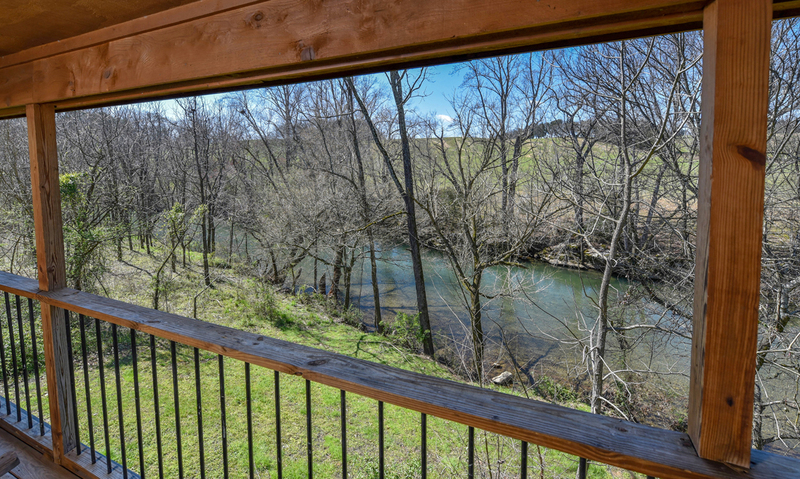 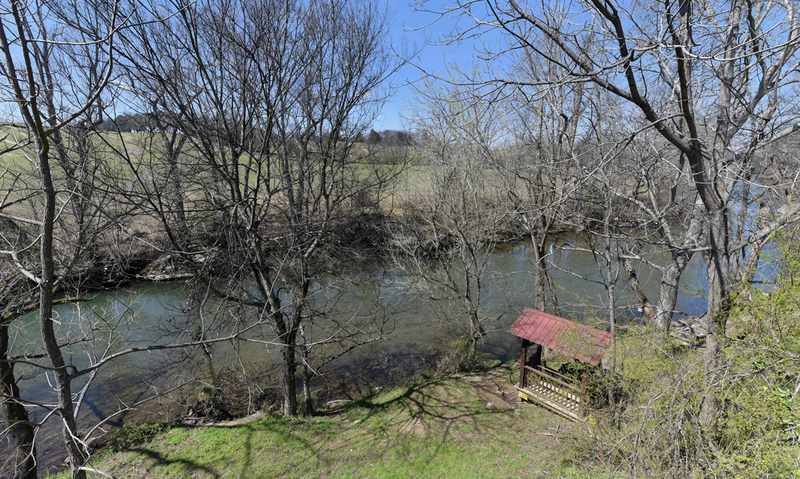 This river runs right by the cabin and provides gorgeous river views for the guests. The hot tub is perfect for the days and nights that you need to relax. 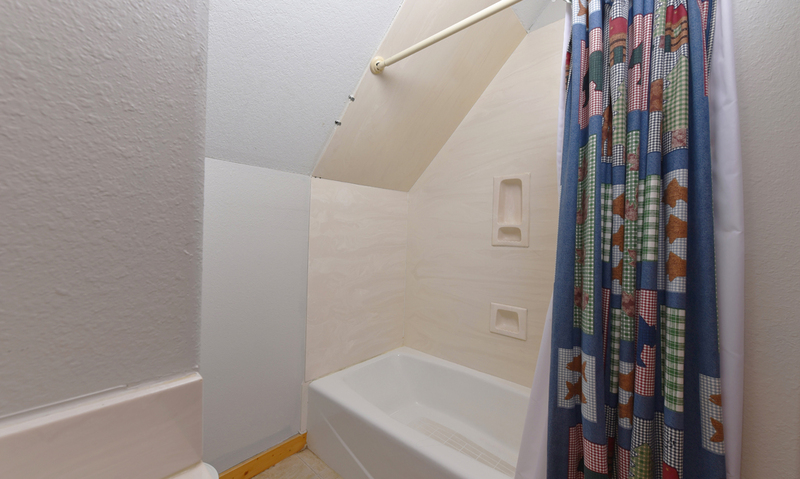 Take a much-needed soak and catch up with the ones you love after the fun and excitement exploring downtown. 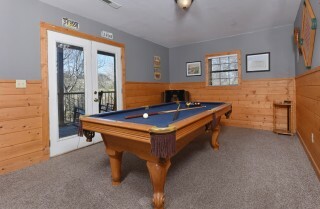 During those hot summer nights in the Smoky Mountains, you and your group can enjoy playing in the river by the cabin. At River Retreat, there is no need to eat out every night. 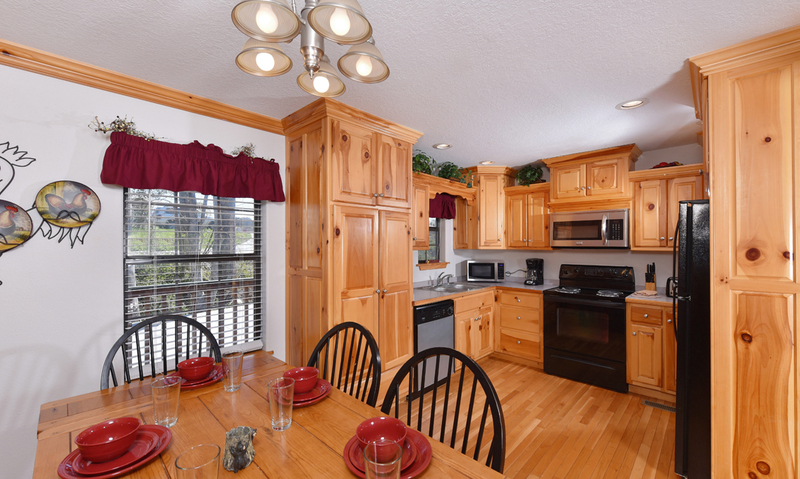 Use the well-stocked kitchen to prepare meals in the Smoky Mountains, saving you money and helping you to create lasting memories. 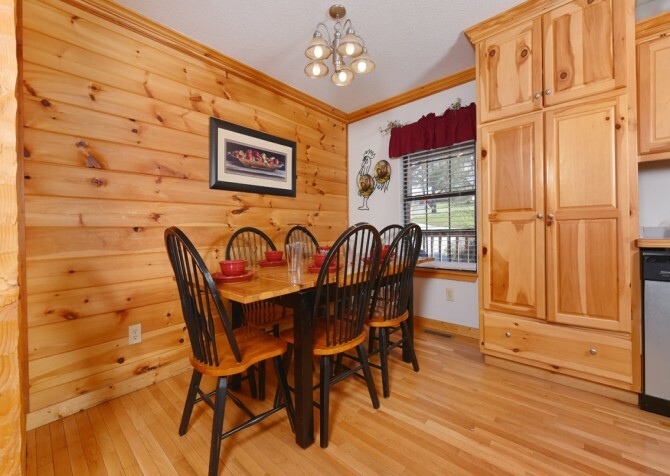 You’ll find the essentials for preparing meals and snacks, and you can sit down at the quiet dining table for a lovely meal with the ones you love. 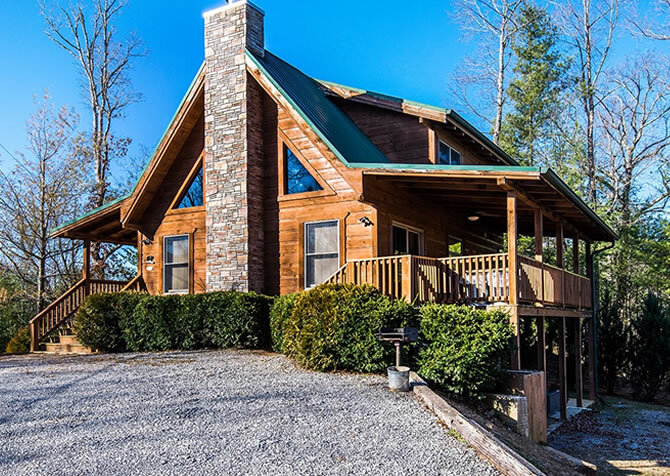 If you prefer to go out, this cabin is located less than eight miles from the downtown Pigeon Forge restaurants. 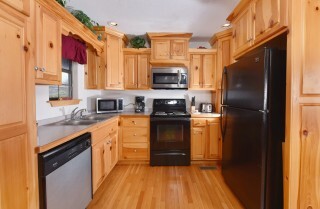 A large variety of cuisines is available, from Chinese and American to Mexican and German. Those with a sweet tooth will love the places to get cupcakes, ice cream, cookies, funnel cakes, chocolates, and more! 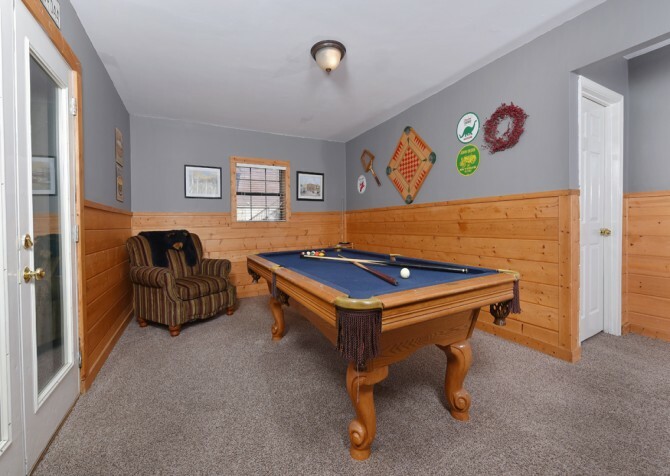 Other amenities at River Retreat include wireless internet, a washer and dryer, a foosball table and pool table that have provided many guests with hours of fun and entertainment without ever leaving. 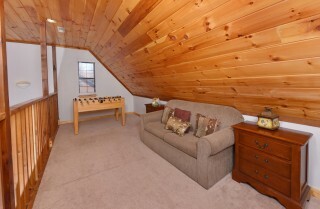 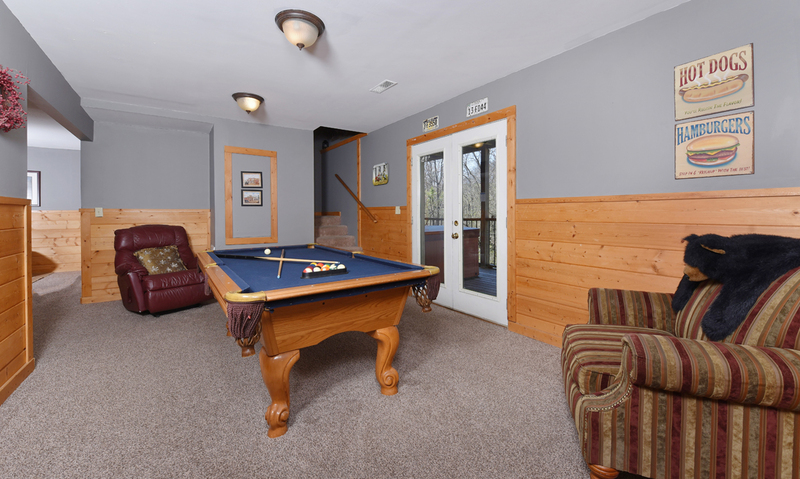 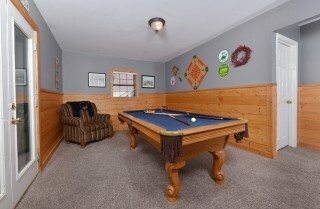 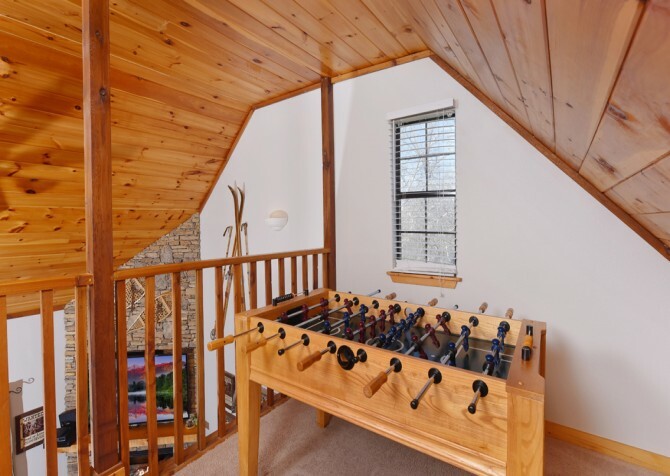 The pool table and foosball table are perfect amenities for those rainy or cold Smoky Mountain days. 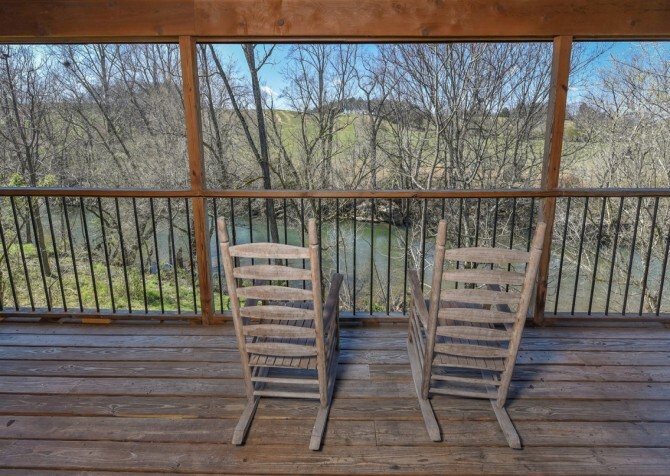 Sit on the porch and watch the sun set as you gaze at the natural beauty of your cabin on the river. 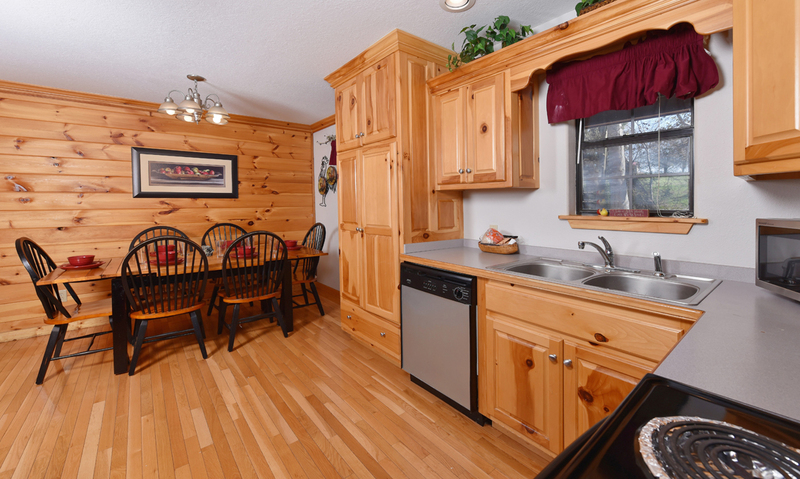 With so many amenities in one place, it is no wonder guests love returning to this cabin year after year. Call Cabins For You today so you can reserve your next family or small group vacation in Pigeon Forge at River Retreat. The rates listed are one bedroom prices. Prices vary for use of other bedrooms. Give us a call at 1-800-684-7865 today if you have questions on pricing or availability. 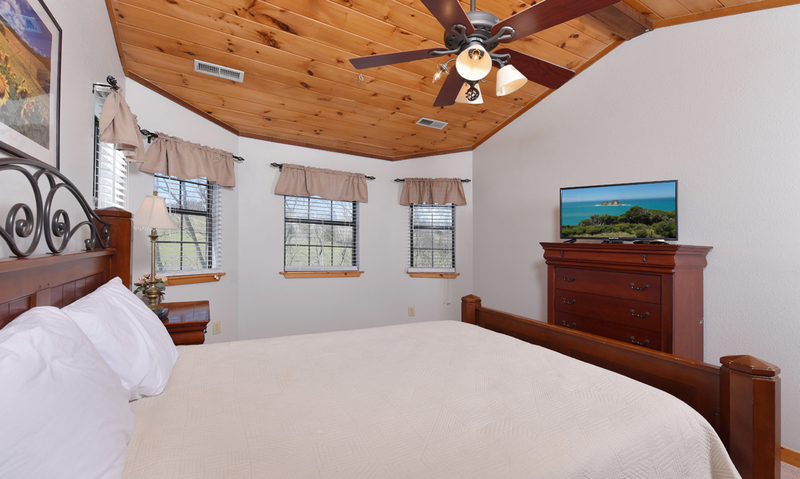 We would love to help you plan your next getaway! 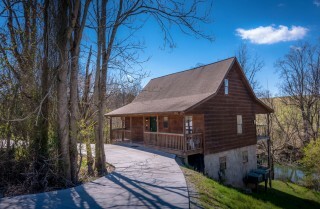 "My family and I took our dad to Tennessee September 8th for his 82nd Birthday. 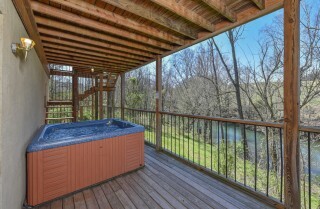 We booked a cabin with Cabins For You (River Retreat).Our first time with this company. When we arrived we were very pleased with the cabin. It was clean, neat, and beautifully decorated. 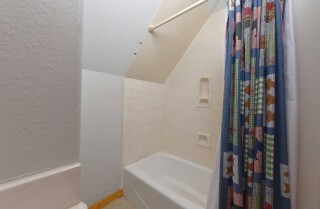 It had kitchen supplies, towels, sheets, and it was very well supplied. The ladies enjoyed the hot tub, while the guys enjoyed the pool table and we all enjoyed the river. 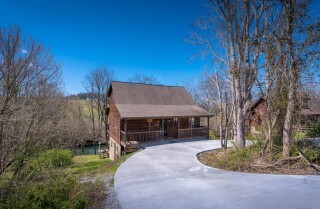 We loved the location of the cabin it was quiet, peaceful, and…"
"My family and I took our dad to Tennessee September 8th for his 82nd Birthday. 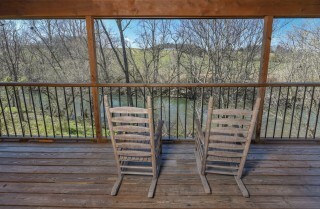 We booked a cabin with Cabins For You (River Retreat).Our first time with this company. 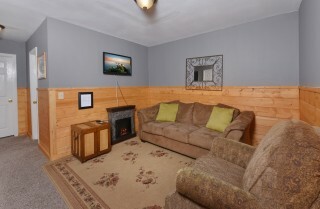 When we arrived we were very pleased with the cabin. 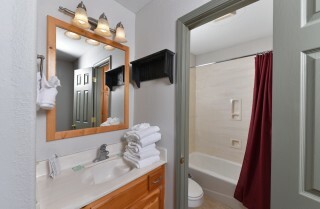 It was clean, neat, and beautifully decorated. It had kitchen supplies, towels, sheets, and it was very well supplied. The ladies enjoyed the hot tub, while the guys enjoyed the pool table and we all enjoyed the river. We loved the location of the cabin it was quiet, peaceful, and relaxing but yet not to far from town. 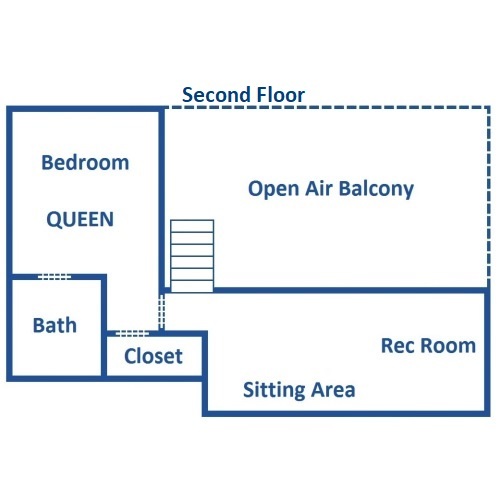 I got the key code by email which was very convenient. We enjoyed our stay with Cabins For You and look forward to our next visit. 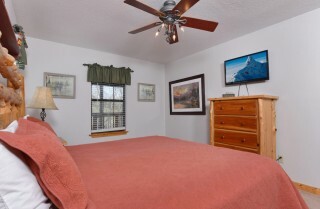 I would recommend this company to anyone for a nice relaxing vacation."